A wanderer on two wheels, I love nature with all its sights as much as I love the thrill of adventure. Although I majored in Economic Studies, I chose to work as a personal trainer at a gym in my hometown. I currently own a Suzuki V-Strom 650 (DL650), perfect both for on-road and off-road riding. My journey was due to start on a Saturday morning. Right after work on Friday evening, I went to my garage and made sure everything was in order with the bike and the maps, so that I could leave bright and early the next day. I had quite a ride ahead of me. I woke up at around the break of dawn, which was no easy thing to do. Got on my bike and didn’t stop until I reached the first gas-station, where I filled the tank and ate my version of a power breakfast: coffee and a chocolate croissant. I tanked up the Suzuki four times during my trip, but I refueled on coffee much more often. About 19 gallons of gasoline went into a 1242 mile (2000 kilometers) journey. 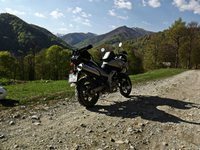 Luckily, the DL650 makes for a good ride on any kind of road, which sadly, is paramount on Romania not-so-great asphalt. 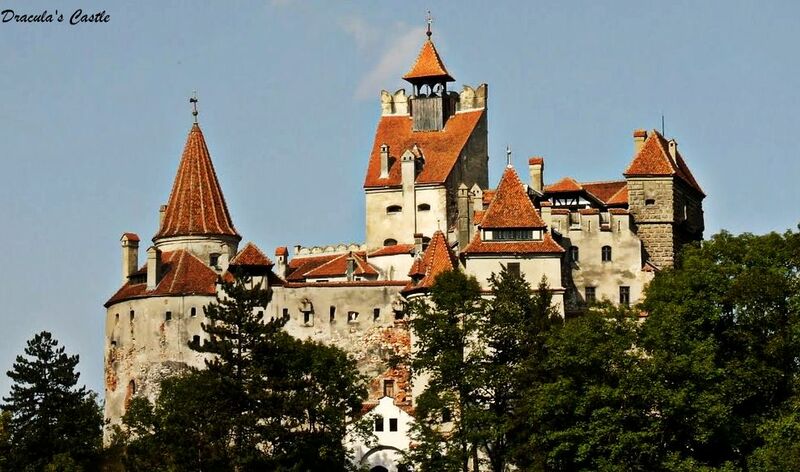 The first stop I wanted to make along my way was at Bran Castle, better known to the Western World as ‘Dracula’s Castle’. It’s located on the Bran-Rucar mountain-pass, a wide gorge which basically surrounds you with mountains, everywhere you look. However, the gorge was not at all linear, but more of a mountain corridor made entirely of curves. It’s as if someone gathered all the winding roads in the country, glued them together somehow and decided to spread them between Rucar and Bran. The infamous castle is situated on a 20 ft. (60 meters) high hill, framed by the peaks of two mountain chains, called Bucegi Mountains and Piatra Craiului. It is like you are in the inside of a snow globe, minus the snow. The castle definitely has a sense of eeriness about it, the kind that makes you want to go inside expecting a paranormal experience of some sort. Most likely you won’t find any in there, what you will find however is extremely small and narrow hallways, rooms and stairways that make you wonder just how short people were back then (in the 15th century, that is, when Vlad the Impaler aka Count Dracula ruled Transylvania). After visiting the castle I proceeded to a small town called Novaci, which is the starting point of the Transalpina, a road of royal origins which goes up so high, you are literally above the clouds. It is the highest paved road in Romania. Transalpina reaches the highest altitude in the Urdele mountain pass – aprox. 7037 ft. (2145 meters). The beginnings of this road are somewhat in the mist, as there are many theories as to when/why it was built. It has been dubbed everything from ‘The Devil’s Path’ to the ‘King’s Road’, which says a lot about all the things that might have happened on it. Also a story has it that Nicolae Ceausescu had the Transfagarasan Road (DN7C) built during the communist regime just to surpass the Transalpina. Works began in 2007 in order to transform this spectacular road into a modern highway, 92 miles (148 km) long. 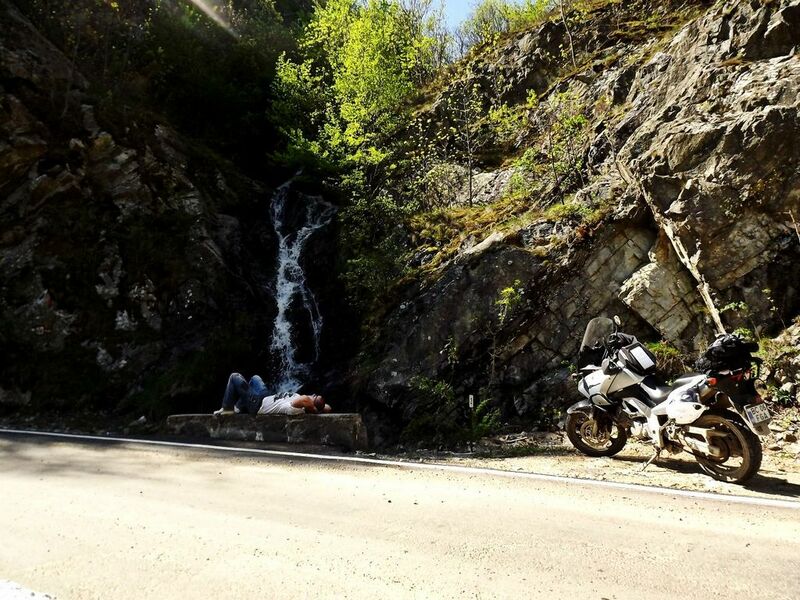 It’s definitely not an easy ride and the quality of the road leaves something to be desired, but the twists and turns along with the breathtaking sights make it all worth it. As you ride upwards and the road gets bumpier, the air you breathe gets fresher and the sense that you are standing above the world is almost overwhelming. 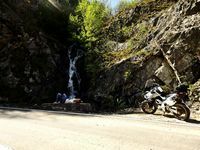 After the Urdele Pass I went down to the place called Obarsia Lotrului, from where I entered the Cernea Valley, a 37 miles (60 km) road that dives right into the heart of nature. This is a great place for a pit stop, taking picture and clearing your head and lungs of all that urban pollution. Around dusk I got to the Baile Herculane, one of the oldest spa cities in the world. It was first mentioned in documents over 1800 years ago. Baile Herculane is also found within the Cernea Valley (Valea Cernei) and it is part of the Valea Cernei-Domogled National Park, a particularly rustic location. Cernea Valley is a fascinating place to see and Baile Herculane is located at an altitude of 524 ft./160 meters, on the same parallel as Nice and Venice. That ensures a calm and pleasant climate, with Mediterranean influences. Since the Watermills Park was very close to the the spa city (only a 12 miles ride away), I decided it would be best to spend the night in Baile Herculane, so that I could be at the Rudaria Molinological Park quite early the next morning. The road leading to Rudaria Valley (Valea Rudariei) is nice and straight. Once you get there, it’s better to park your motorbike and start hiking, the sights are just too beautiful to miss. Along the river which gave its name to the Valley, there still are 22 watermills from different eras. It’s not often that you can enjoy such a visual and auditory feast, provided by the water motion in combination with the sounds of the mills at work. There used to be a number of 35 watermills in this region, but a great flood occurred here in 1955 which narrowed the number down to 22 mills that today make the Rudaria Molinological Preserve. Not far from Rudaria is the Bigar Preserve, whose highlight is the Cascade Fall with the same name. This wonderful waterfall is famous because it falls in thin threads of water, which flow over a moss-covered cliff. Moreover, it is located exactly on the 45th parallel north. Bran Castle (Dracula’s Castle) – Built between 1377 -1382 on a 20 ft. cliff, between two mountain chains. 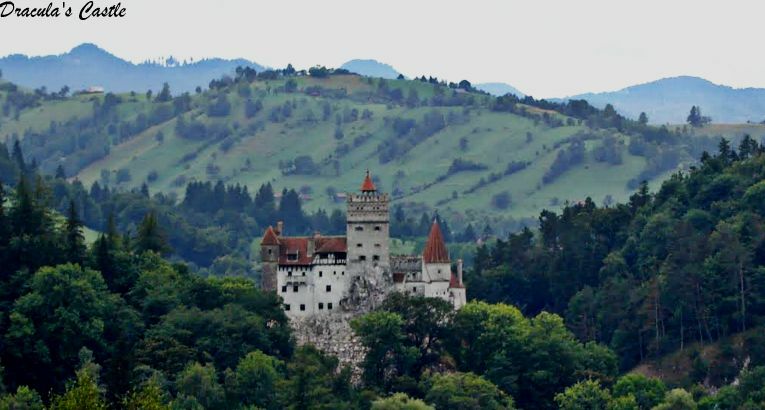 Bran Castle is known to tourists around the world as Count Dracula’s castle, which is one of the reasons why CNN included it in a countdown of the world’s most beautiful castles. It was partly furnished by Queen Marie of Romania, one of Queen Victoria’s granddaughters who chose to marry the king of Romania instead of the future king George V of England. 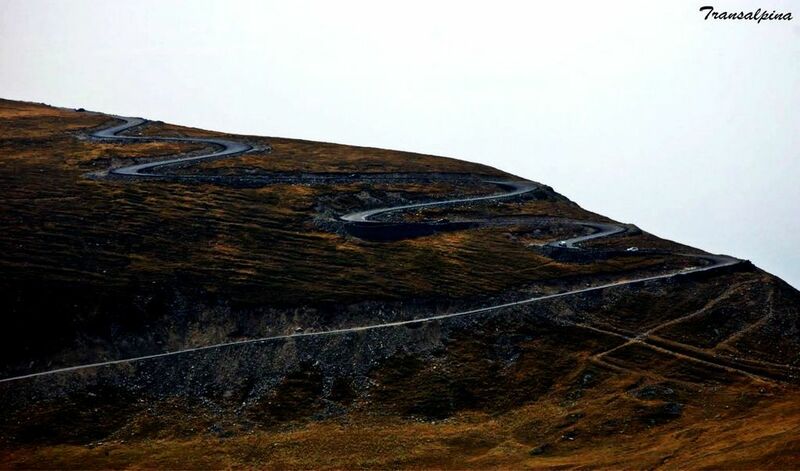 Transalpina – the highest paved road in Romania, as well as in the entire Carpathian Mountains chain. It reaches the highest altitude in the Urdele mountain pass – aprox. 7037 ft. (2145 meters). The origins of this road are a bit unclear. Some sources claim it was built by Roman legions during the Roman-Dacian wars (101-102, 105-106), which would explain why on the history maps, Transalpina is mentioned as ‘4th strategic Roman corridor’. Other historians say that the highway was built and paved by Germans during WWI, who put it to little use, nonetheless. 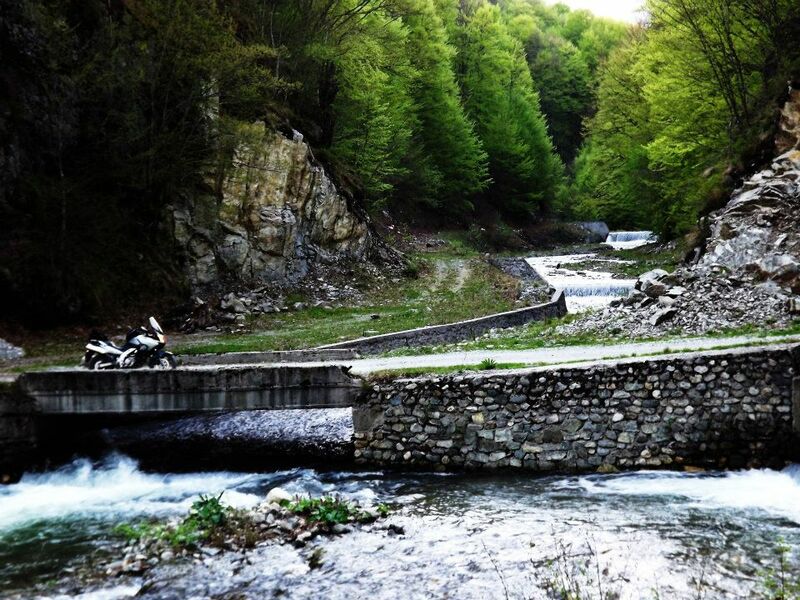 The Rudaria (Eftimie Murgu) molinological park – a preserve made up of 22 watermills from different eras. 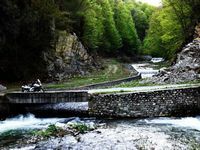 The watermills that exist in these places have a built-in hydraulic system which uses something called “ciutura” ( a turbine similar to the Kapllan system), thus being the most vast molinological park in Southern Europe. It is a fascinating place where the wilderness melts with dreaminess. The Bigar Cascade Falls - Late in 2012, Bigar ranked #1 in a countdown of unique waterfalls around the world, compiled by the online magazine World Geographic, and rightfully so. To paraphrase from the original World Geographic article, it is one of the most beautiful waterfalls in this country, very unique in the way the water is spread and also in the way it falls in thin shreds of water. The waterfall is situated exactly on the 45th parallel north, which is again, quite unique. The dramatic moss-covered falls is formed by a spring located in a cave and spills into the Minis River.